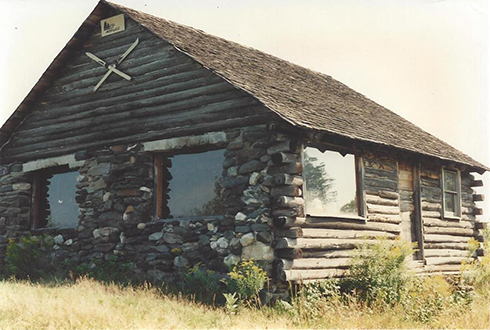 CABIN HISTORY: The original log cabin at the top of the Pinnacle, was built in 1964 on land that belonged to Lyle Farnsworth of Westminster. 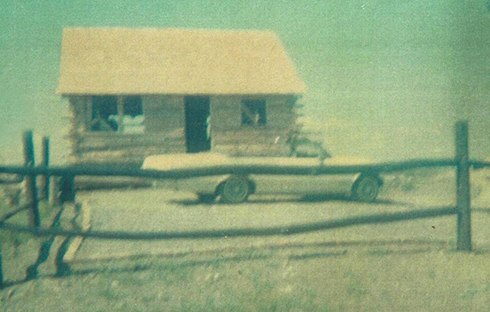 The original 1964 summer cabin had running water for the kitchen and bathroom. The cosmopolitan convertible in the parking area proves the road to the cabin was quite passable. No large trees are visible around the building. At first a well-equipped summer place with running water for the kitchen and bathroom, the cabin was bought in 1987 by the Littman Family of Westminster and Connecticut. The building was in substantial disrepair when the cabin and its 47 acres were generously donated to WHPA by the Littmans on August 28, 1997. 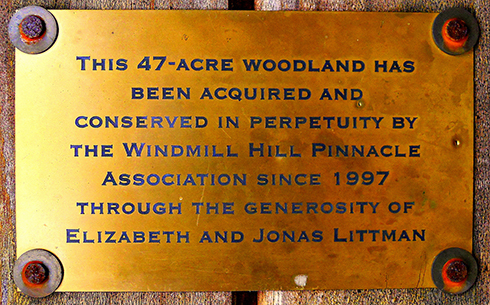 A brass plaque, displayed inside the shelter, acknowledges the Littmans’ generous gift of the cabin and its surrounding land to WHPA – which made the Pinnacle experience possible for generations of visitors and guests. 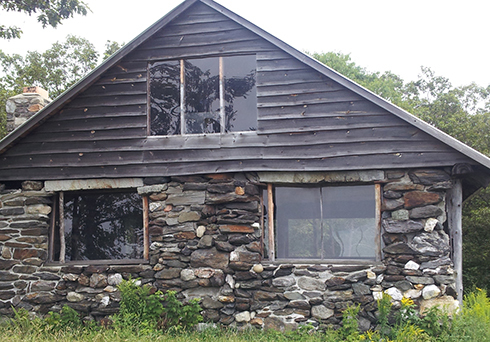 Since a grant from the Vermont Department of Forests, Parks and Recreation could cover the materials for a lean-to, but not a house, the building’s kitchen, bathroom, and part of the south wall were removed and a sleeping loft created in the resulting open space to convert the house into a shelter. By September 1999 the conversion had been completed by volunteers. 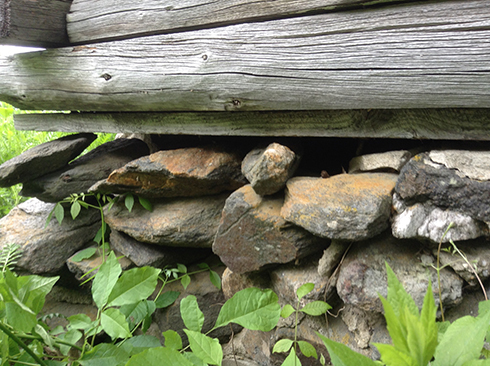 Several logs on the east side had been replaced, the stone wall on the west side repointed, a metal roof installed, wide entry steps built, and an outhouse constructed. For 17 years the shelter provided a special haven from bad weather and a place for meetings and overnights – all the while allowing its visitors a connected spot where they could enjoy nature and each other. Click here to read excerpts from the Pinnacle Cabin Notebooks written by grateful visitors and overnight guests at the shelter. THE RENOVATION PROJECT: Unfortunately the years took a toll on the cabin, and substantial professional maintenance was needed to ensure the shelter’s safe and appealing existence for present and future generations. Renovation began in summer of 2016 and was finished in late fall. Removing the old outhouse roof and replacing it with metal roofing (work by a volunteer). CAMPAIGN SUCCESS: The original estimate to make the repairs and improvements and to create an endowment to take care of future maintenance costs was set at $31,000. Thanks to the financial generosity of individual donors; contributions from The Grafton Improvement Association and Chroma Technology; grants from Mascoma Bank ($4,000) and the Windham Foundation ($4,500); volunteer help by Oliver Brody In designing, fabricating, and installing the new windows; and professional help by master builder Phil Pellerin and son, Izaac, we covered costs for the needed repairs and have a product far better even than planned. For instance, the Pellerins went beyond their contracted carpentry and stone work by contributing a superb fire pit, stone benches, and other special details that enhance both the cabin and its surroundings. At the west wall’s left window, note missing stones to the left of the upper granite lintel that is too short and broken, and the branches providing some security for the windows. Rebuilding the west wall from the ground up and adding new granite lintels top and bottom will fix the window openings and also improve the jagged corner at the right of the building. Gaps in the east-wall foundation show tenuous support at the corner. Foundation stones will be added where missing. Click here for pictures and information on the renovation project. The Farnsworth Family built the original cabin at the Pinnacle. This note of appreciation is posted inside the shelter. 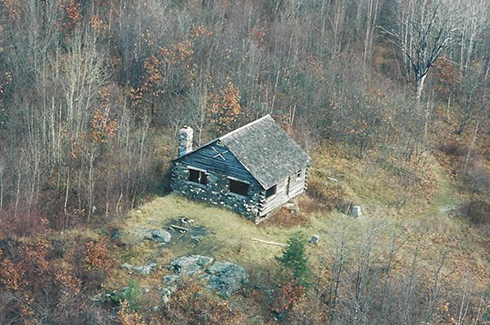 This aerial view of the original cabin shows the south and west sides after the Littmans’ 1997 gift to WHPA, but before the first renovation. Note the surrounding trees that grew up in the 33 years since the cabin was built. Close-up of the SW corner of the cabin before the first alterations and before the south side was opened up. 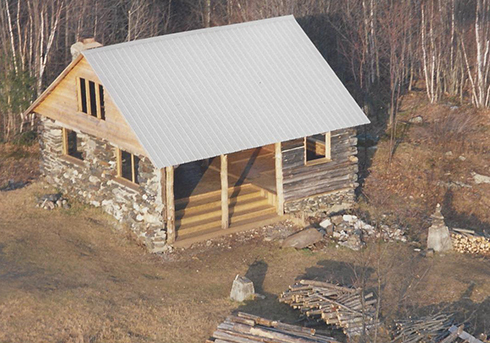 This aerial view of the south and west sides of the cabin-turned-shelter, renovated in 1999, shows new western clapboards, a half-open south side with broad steps, and a new metal roof. 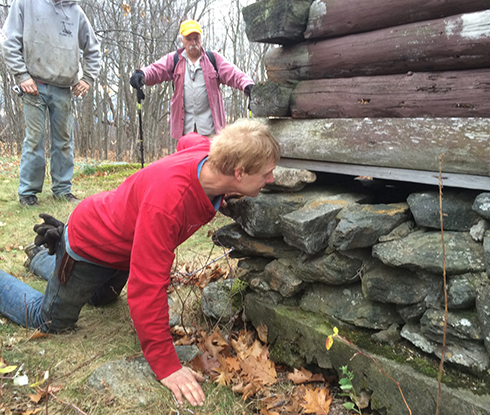 Master Builder Phil Pellerin inspects the foundation, where sections are missing stones and need repair or rebuilding. The broken window shows stop-gap repair. 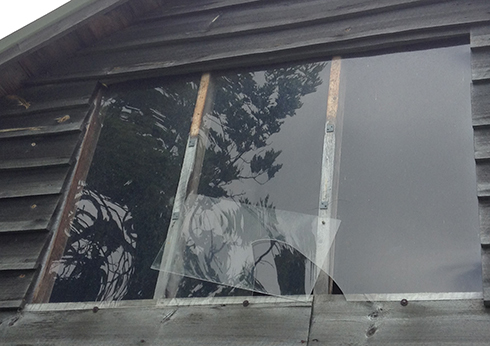 All cabin windows will be replaced. 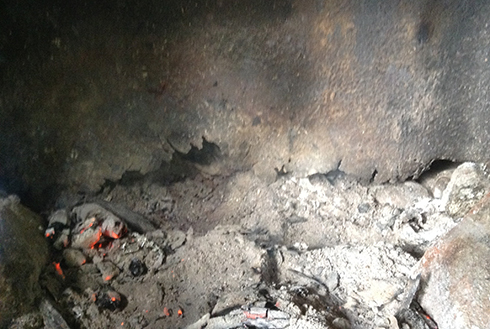 New welded steel plates in the fireplace insert will repair holes, contain the fire, and prevent a potential hazard. 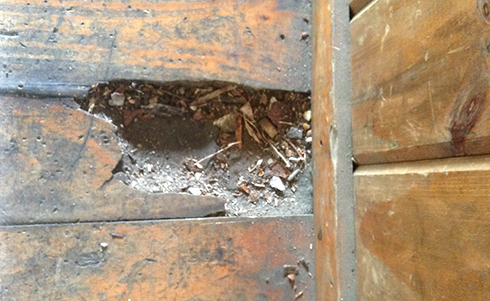 Rotted flooring will be replaced.